Would you happen to know what types of engineering and science curriculums are being taught there? The male student with the thumbs up will be highly successful in life . I don't know about those courses sorry, not my fields of study. Aha... the university has them all . You can see future in crystal? Hey better than not see nothing . Sorry bad english on that one...better than see nothing . 2 year program at RBAC? Yes, I think that's the minimum depending on what you're studying. 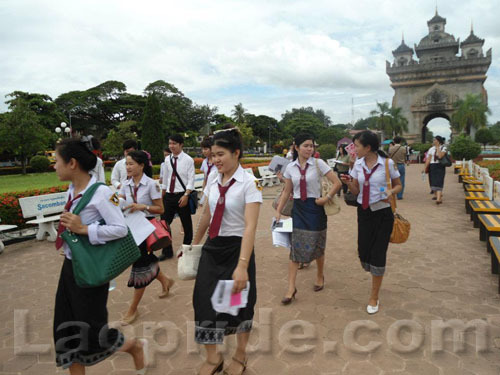 How the job prospect in Laos for these lovely ladies ? Too bad. Normally RBAC students don't speak English. They should have emphasis more on English. Comcenter seems better. I think they have language training there. ending up being pub owner selling beer? English is the universal language in any worldwide business environment and highly agreeable for Laos to conccentrate on English.